We live in a 13.8 billion-year-old universe, and its baby photos are stored away in four years’ worth of data from the European Space Agency’s Planck spacecraft. This week, astronomers have unveiled what may be the most precise maps of the universe when it was just 380,000 years old. The data were presented at the Planck 2014 conference in Ferrara, Italy, this week, and they’ll be publically released before the end of next month. 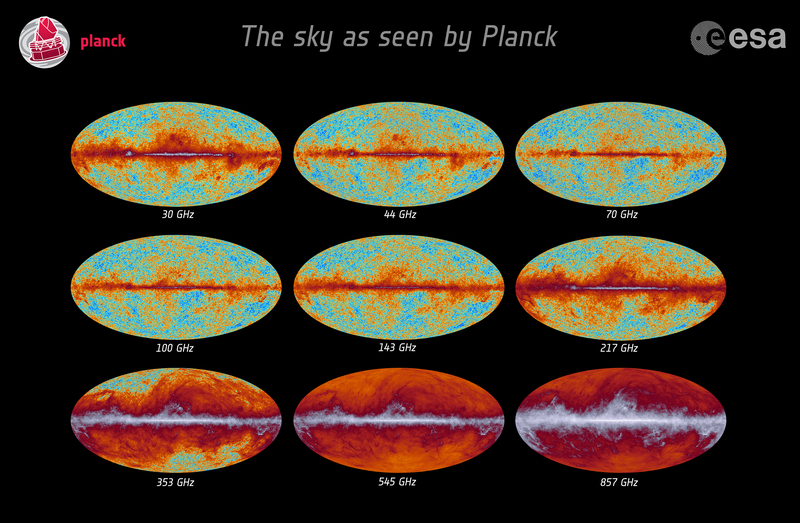 Launched in May 2009, Planck was designed to map the entire sky in nine frequencies, ranging from microwave to sub-millimeter wavelengths. Its mission: to observe the first light in the universe. Immediately after the Big Bang, radiation filled the universe, and remnants of that radiation is observed by us today as the cosmic microwave background (CMB). You can think of CMB as the hazy afterglow of the Big Bang — a snapshot of the oldest light that imprinted on the sky during the universe’s infancy. As the universe expanded, radiation cooled and stretched to microwave wavelengths, which have temperatures that vary slightly across the sky. In the above image, released in March 2013, you can see the tiny temperature fluctuations (red is warmer, blue is cooler). These correspond to regions of slightly different densities, representing the seeds of all the stars and galaxies we have today. Planck had been continuously surveying CMB radiation up until it stopped operations back in October 2013. Besides more precisely confirming preliminary data, here’s something new. In addition to temperature, the microwaves also differ slightly in their polarization, or the way the waves align with each other. The new maps how the microwaves are polarized, New York Times explains, which could shed light on what was going on when the universe was a trillionth of a trillionth of a trillionth of a second old. The new data also rule out some ideas about dark matter — the mysterious substance that holds galaxies together. By studying all these subtle variations in temperature and polarization, as well as the distribution of galaxies, researchers were able to piece together this recipe for the universe, Science reports: 5 percent ordinary matter, 27 percent dark matter, and 68 percent bizarre space-stretching dark energy. Next articleWill PIA take off?